A piece of paper is one of the most common, versatile daily items. Children use it to draw their favorite animals and practice writing the A-B-Cs, and adults print reports or scribble a hasty grocery list. Now, connecting real-world items such as a paper airplane or a classroom survey form to the larger Internet of Things environment is possible using off-the-shelf technology and a pen, sticker or stencil pattern. 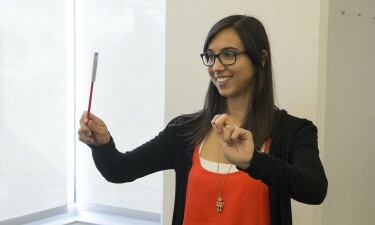 Researchers from the University of Washington, Disney Research and Carnegie Mellon University have created ways to give a piece of paper sensing capabilities that allows it to respond to gesture commands and connect to the digital world. The method relies on small radio frequency (RFID) tags that are stuck on, printed or drawn onto the paper to create interactive, lightweight interfaces that can do anything from controlling music using a paper baton, to live polling in a classroom. The researchers will present their work May 12 at Association for Computing Machinery’s CHI 2016 conference in San Jose, California. The technology — PaperID — leverages inexpensive, off-the-shelf RFID tags, which function without batteries but can be detected through a reader device placed in the same room as the tags. Each tag has a unique identification, so a reader’s antenna can pick out an individual among many. These tags only cost about 10 cents each and can be stuck onto paper. 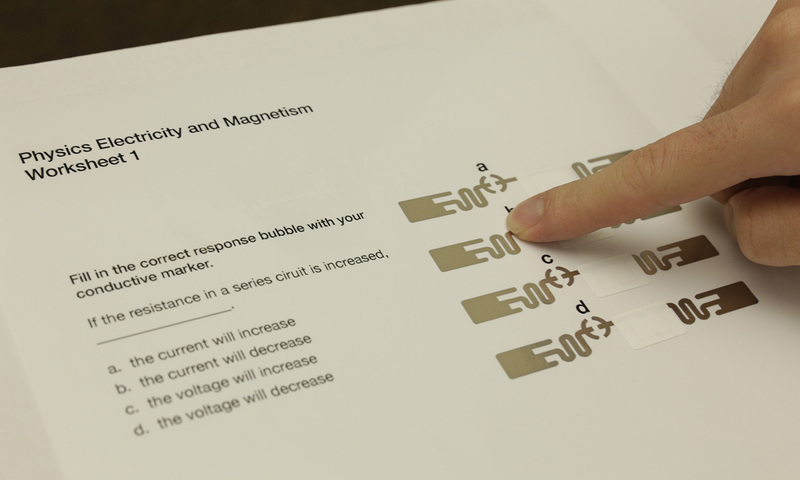 Alternatively, the simple pattern of a tag’s antenna can also be drawn on paper with conductive ink. When a person’s hand waves, touches, swipes or covers a tag, the hand disturbs the signal path between an individual tag and its reader. Algorithms can recognize the specific movements, then classify a signal interruption as a specific command. For example, swiping a hand over a tag placed on a pop-up book might cause the book to play a specific, programmed sound. The researchers developed different interaction methods to adapt RFID tags depending on the type of interaction that the user wants to achieve. For example, a simple sticker tag works well for an on/off button command, while multiple tags drawn side-by-side on paper in an array or circle can serve as sliders and knobs. “The interesting aspect of PaperID is that it leverages commodity RFID technology thereby expanding the use cases for RFID in general and allowing researchers to prototype these kind of interactive systems without having to build custom hardware,” said Shwetak Patel, the Washington Research Foundation Entrepreneurship Endowed Professor in Computer Science & Engineering and Electrical Engineering. They also can track the velocity of objects in movement, such as following the motion of a tagged paper conductor’s wand and adjusting the pace of the music based on the tempo of the wand in mid-air. 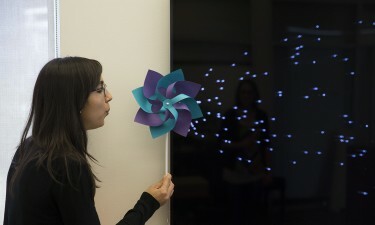 This technique can be used on other mediums besides paper to enable gesture-based sensing capabilities. The researchers chose to demonstrate on paper in part because it’s ubiquitous, flexible and recyclable, fitting the intended goal of creating simple, cost-effective interfaces that can be made quickly on demand for small tasks. 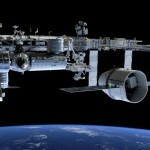 Other co-authors are Josh Fromm of UW electrical engineering; Eric Brockmeyer and Elizabeth Carter of Disney Research; and Scott Hudson of Carnegie Mellon University. This research was funded by the UW and Disney Research. For more information, contact the researchers at paperid@cs.washington.edu.